It is unlikely that now it is possible to surprise someone with how solar energy works on the Earth. The sun supplies us with electricity, heats our homes, gives life to our electronic devices. And the further, the more solar energy is included in everyday life, winning more and more new positions. And no one is now surprised by a wristwatch on solar batteries, calculators, flashlights, receivers, mobile phones running on solar panels. In the campaigns, on vacation, in the country solar panels – an indispensable thing. We are now building country houses, cottages, which are fully located on the "Sunny security" and do not depend on the common networks of energy. The sun gives electricity to these houses, the sun heats them, illuminates the garden near the house, the street. This electricity is enough to work all appliances in the house – refrigerator, TV, vacuum cleaner, washing machine, electric stove. But it's in the house. And what about outside the house, in the fresh air? In summer, it is much more pleasant to eat on the veranda, in the gazebo. You can, of course, cook in the house. And then carry it to the table. As you near the veranda, a gazebo to put in the solar oven and prepare everything on the spot. And, that is called, with heat, with heat – directly on the table. Solar furnace and so good that does not take up much space, easy to assemble and install. It does not require any fuel, does not pollute the environment, easy to fold after use. This is an indispensable thing for giving, for going out of town for a picnic, for Hiking. These furnaces can be of different sizes, different designs, folding and stationary, but the principle is always the same – to collect the sun's rays in a beam and send them to where there will be a container in which food is prepared. And how this beam of solar energy is used largely depends on the design of the furnace. In 1956 there was the first solar oven. Parabolic mirror focused the sun's rays on a special stand, on which a vessel with water was installed. After a short period of time, the water began to boil. Journalists photographed this miracle of technology from all angles, the press appeared a few short notes, and that was it. From the industrial production of such devices then abandoned. But craftsmen, unlike industry, took the novelty with enthusiasm. It began to modernize, new design solutions, a lot of homemade devices. These were already proven parabolic mirrors, but with rotary mechanisms that allow you to turn the mirror after the sun, without changing the location of the container for cooking. These were solar ovens made of improvised materials – wood, cardboard, tin. There were also more complex designs that combine a traditional mirror hub and oven. All these devices were light, compact, easy to assemble and disassemble. They took up very little space in backpacks and did not require any fuel. Therefore, so willingly they took with them on hikes, on various country picnics. After their use there was no ash, no coal – nothing. And cook on these furnaces could be anything. From simple boiling water, to fish soup, kebabs, barbecue. Make yourself a solar oven is no special difficulty. Usually, getting to the manufacturer, subject only to what, in fact, constructed this design. And the question of how to make a solar oven is not worth it at all. If we are talking about the installation of such a furnace in the country, in a cozy place near a country house, here you can think about the construction of a solid, stationary structure. For Hiking, you can use an easy collapsible design. Somewhat more complex, but also collapsible installation can be done if you plan to travel by car out of town for a picnic. The simplest solar oven craftsmen collect from an umbrella. On the open umbrella on the inside is glued mirror film or just aluminum foil. The handle of the umbrella it is desirable to remove. And oven ready. It remains only to stick into the ground stand for the pot, kettle, saucepan, next to fix an improvised mirror, focus the beam of light on the place where there will be a container of cooked food. And oven ready. Some masters cover the inner surface of the umbrella with a mosaic of mirrors. But it is much heavier design, making it virtually non-separable or disposable. For more complicated designs need a very large cardboard box (approximately half a meter each side), four blocks of wood, equal in length to the height of the box cross-section 25x25 mm, the glass having a size equal to the sides of the box. Also need a will heat-resistant black paint (necessarily non-toxic! ), a few bricks (how much will fit on the bottom of the box), mirror film or aluminum foil. Box painted inside with black paint. The same paint to paint and bricks. Can be painted in two layers. To withstand for some time that the paint has well dried out and out of the box would erode her scent. On the top four wings of the box stick a mirror film or foil. At the corners of the box to strengthen the wooden bars. They will hold the glass. Lay on the bottom of the box the bricks. Now it remains to put it in place, the most illuminated by the sun. The oven is ready for operation. On the bricks you can put the pot, kettle, pan. Orient the mirror covers of the box so that the maximum amount of sunlight gets inside, cover the box with glass and wait for the food to prepare. Inside the box, the temperature can exceed 200°C. Bricks, heating, retain heat if the sun suddenly disappears behind the clouds. 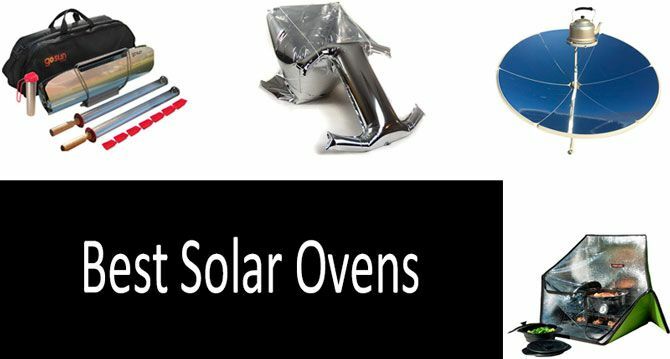 As for the solar furnaces produced by the industry, their creators have already given vent to imagination, equipping these devices with all imaginable and unthinkable devices. Lightweight, folding as a suitcase, they in minutes, installed in operative position. These furnaces combine parabolotsilindricheskogo solar concentrators and vacuum tubes. The focus parabolotsilindricheskogo mirrors are located a long vacuum tube. But instead of a low-boiling liquid in the inner cavity there is a tray in which are placed the products for cooking. The pallet is inserted into the tube and fixed. The vacuum around the inner cavity provides reliable thermal insulation and high temperature inside it. The temperature in the inner cavity may exceed 300°C. In order to control the temperature in the working chamber, a thermometer is installed at the end of the vacuum tube. It is an integral part of the electronic control unit. This unit has a thermostat with a preset operating temperature, a mirror rotation control system, a timer that closes the mirror after a specified time and beeps. All electronics are powered by a solar panel built into the case. Once assembled, this stove has the appearance of a suitcase with a length of about 75 cm, height of about 40 cm, thickness 11 cm. it Weighs just over four pounds. And you can cook in it anything: meat, fish, vegetables. You can bake pies. And of course, its most important advantage is an environmentally friendly device that does not consume any other energy than solar energy, and does not pollute the environment. Of course, it would be naive to believe that helium furnaces can fully replace traditional – gas and electric. But in campaigns, in suburban areas, countryside picnics they are successfully replacing the old bulky devices that require you to still have fuel, and leaves behind a pile of ash, blackened dishes. Environmentally friendly, sparkling mirrors solar furnaces confidently take their place in our daily lives.